Sue and Ed own a Denver-based training company called "Love My Dog Training" (You might recognize the name from the "Ask The Trainer" column in our newsletter). We have partnered with them to provide, through their new web-based business, a Basic Training course in an effort to help keep dogs in their homes and out of shelters. To move toward that goal, they are offering their online training course which includes videos and handouts accessed online for $20 for a 30 day subscription. Since we have partnered with them, they will donate $5 (25%) of the subscription to Dalmatian Rescue of Colorado. BUT... in order for us to get the donation you must subscribe through the link provided on this page. 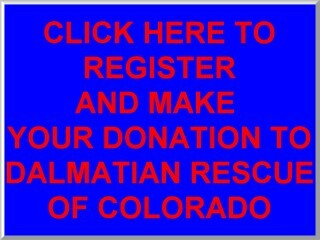 Please check them out, by clicking the button below, and subscribe to this training program to help you and your dog and provide a $5 donation to Dalmatian Rescue of Colorado.